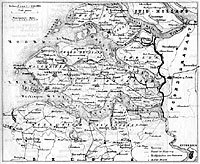 An index of all death certificates for the period 1811-1939 is being created for the province of Zealand (Zeeland). Besides necessary data (name and age of the deceased, names of parents and spouses, etc. ), data referring to occupation will be entered into the database. The HSN designed a special (AKON) entry program, based on an existing HSN entry module for death certificates. The project started in September 1996. By the end of 2003, about 500,000 death certificates had been processed, almost 90% of the anticipated total number of entries (550,000). Processing is done by about 25 volunteers, supervised by L.M. Hollestelle (Zeeuws Archief). The AKON-project is expected to be finished by the end of 2004. All death certificates are accessible via the ISIS-database on the website of the Zeeland Archives. In September 1997 a new entry program (AKON 3.10) was introduced. New in this version was the introduction of pick-lists for occupations and municipalities. For Schouwen-Duiveland a special version was created (AKONS). In this version the complete certificate is entered into the computer.